If Phillip Hughes was fatally unlucky to be killed by a single blow of a cricket ball, then Mark Vermeulen is fortunate to still be alive. The Zimbabwe batsman was struck on the head on three different occasions during his career, twice sustaining a fractured skull. The consequences included depression, temporary insanity, an arson attack on the national cricket academy, a spell in jail, attempted suicide and a brush with Robert Mugabe's henchmen. "It could have been a lot worse for me, not only the injuries, but the outcome of all the other events," Vermeulen told BBC Sport. "Phillip Hughes could have been me 10 years ago." Remarkably, the 35-year-old made a redemptive return to Test cricket earlier this year, but opted to retire after only one match, ending a career that almost cost him his life. Vermeulen, the son of a dentist, made a promising start to his international career, scoring 61 in his second Test against England at Lord's in May 2003. By this time, though, he had already been hit on the head playing for Zimbabwe Under-19s and suffered a first fractured skull while batting in the nets at the 2003 World Cup in South Africa. But it was a sickening third head injury that would change the then 24-year-old's life. On 20 January 2004, Vermeulen was facing India's Irfan Pathan in a one-day international in Brisbane. A bouncer, an attempted hook. Leather cracking skull once more. "I thought I was fine. I thought I would take off my helmet and carry on batting," he reflected. "It was only when I started walking off the field, then half-an-hour later, that I felt the pain. When I was in the ambulance I thought that surely this has got to be it - I can't keep going through this. "The doctor who did the operation on me said I shouldn't really play cricket again because if I got hit, it could be fatal. "After a time, because I loved cricket so much, I thought I'd keep giving it a go and see what happened." Vermeulen was back playing international cricket only two months later, but, by his own admission, his performances suffered because of the fear of being hit again. By the summer of 2006, the consequences of those blows were proving far more serious than a shrinking batting average. Vermeulen had previously shown a tendency to find trouble - he once took the stumps and locked himself in the changing room after a decision in a school game with which he disagreed, and was sent home from Zimbabwe's 2003 tour of England for disciplinary reasons. But an incident while playing for Lancashire club Werneth would have bigger ramifications. "I saw my father in England, he was enjoying life and getting remarried. I thought 'if he can do whatever he wants, I'll start throwing my toys around and do whatever I want'. "I was getting heckled by some guys in the crowd. It continued until I thought 'I've had enough of this nonsense'. "I threw the ball into the crowd and it hit the step and came back. I picked it up and went to throw it again, but one of my team-mates stopped me. I got into a scuffle. The chairman of the club tried to stop me and he hit me." Vermeulen was banned from playing any cricket in England for 10 years, reduced to three on appeal. He returned home, but his behaviour at Werneth saw the Zimbabwe selectors leave him out of the squad for the 2007 World Cup. Vermeulen's problems came at a time when Zimbabwe was in turmoil as a result of President Mugabe's land reforms and many elite players had turned their back on the national team, which lost Test status in early 2006. Unhappy with administrators who he saw as destroying cricket in Zimbabwe, Vermeulen went to Mugabe, also the patron of the country's cricket board, for answers. "I went to the front gates of [the Zimbabwe president's official residence] State House at 7.30 in the morning and they said 'sit here and wait, he's not in at the moment'. "An hour and a half later, a guy came and put me in a truck saying they wanted to see where I lived. "They went to my place, said it was fine, so we got back in the car and I thought 'great, now I might actually get to see him'. "But they took me to a police station. They asked me a lot of questions about why I wanted to see him and I had to write it down in a letter. They asked for my background, where I went to school. "At 11 in the morning, they said I could go home. I don't know if it was a good thing that I didn't get to see him. It depends what would have gone down when the conversation happened." Depressed, out of the Zimbabwe side and frustrated by the way cricket in his country was being run, Vermeulen - in his own words, "not much of a communicator" - was alone in the capital, Harare. He drove 11 hours to Victoria Falls, the largest waterfall in the world, with suicide in mind. "I'd had enough. I went to sleep in the gorge which the water falls into, wanting to never come back. "The problem was the extreme noise. I was basically sleeping where the water fell in. It was like trying to sleep in a Laundromat with 20 washing machines going off. I slept for about three seconds. "I was ready to end my life, but Victoria Falls is quite an awesome place. It uplifted me a bit. "I wanted to sort things out, but I ended up getting frustrated again as soon as I got back into Harare. I got back at the weekend and by the Monday I'd had enough." 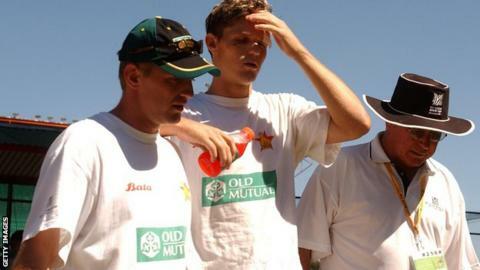 Having failed to take his own life, Vermeulen turned his anger on Zimbabwean cricket. On the night of 30 October 2006, he attempted to destroy the headquarters of the country's cricket board, the Harare Sports Club. "I was frustrated. I thought 'as these guys want to destroy Zimbabwe cricket and steal all the money, I'm going to help them destroy it'. "That was when I decided to burn down the pavilion where they work from. I went to the head office at Harare Sports Club on that Monday night. "I thought if I destroy this, they can't do any work. They can't get any more money, they will have to start from the pavement." His attempt at burning down the building was unsuccessful, the alarm raised before the fire could take hold. The next night, Vermeulen picked a new target, the national academy. "I went off in my brother's car and set fire to the building's thatched roof with a lighter. I watched it catch hold and then I drove away." Before the night was over, Vermeulen was arrested. "I remember refusing to go in the cell. Then, the head officer came and forced me into a three or four metre-square room with about 28 people inside. I spent three nights in there before I was granted bail. "On the second night, people had moved out so there were only 16 people in the room. I actually got a better night's sleep in that cell than in the gorge at Victoria Falls. I was on the concrete floor with the blanket under me. That was quite nice. "All these things were playing through my mind. 'Why did I go that far and do what I did?' It was a lonely, low time where I could reflect on the past and wonder what the future might hold. "In terms of realising that destruction is not the way to fix things, it was a turning point." Facing 25 years in jail, Vermeulen spent the next 18 months on bail, reporting to a police station every day, and to a court every two weeks. It was during this time that psychiatrists, psychologists and doctors investigated the possibility that the head injuries he sustained playing cricket may have been responsible for his behaviour. "They found a misfiring in the left hemisphere of my brain, which caused a temporary insanity. It was a relief, knowing that it wasn't total madness. "That was the route the lawyer took and how I ended up getting off. "At the end of it, hearing the judge say I was not guilty, to know I wasn't going to jail, was a huge relief." Vermeulen was cleared in January 2008 and allowed to play cricket in Zimbabwe later that year, voluntarily donating his match fees to pay for the damage he caused. By 2009, he was back in the Zimbabwe one-day side, but his desire to play Test cricket again saw him play for every one of the country's five first-class teams, including a spell sleeping on the dining-room floor of a shared house while with the Mid West Rhinos. Finally, the form he showed with his home team Mashonaland Eagles, who play at the same Harare Sports Club Vermeulen tried to destroy, led to him being called up to play in Zimbabwe's only Test this year, against South Africa in August. "My team-mates were chuffed that I was back, as were a lot of people in Zimbabwe. There was quite a lot of support. "Some of the fans heckled, but I was able to laugh it off. I got a lot of stick from mates, but it became more of a joke. They would say 'hide your lighters from Vermeulen'. "It was a great feeling to get back into Test cricket after 10 years." Vermeulen made scores of 14 and 21 as South Africa won by nine wickets. He subsequently travelled to Bangladesh with the Zimbabwe A side, but found his body "wasn't coping with the conditions, the heat, because of the head injury I had" and decided to retire. With "things not looking too rosy in Zimbabwe," Vermeulen has moved to South Africa. He may move into coaching, or even try to make it as a professional golfer - "I shot two under on the nine holes I played this morning". But barely two months into retirement, the death of Hughes has highlighted Vermeulen's fortune in emerging relatively intact from his own brush with cricketing fate, and the extraordinary events that followed. "When I first heard that he'd been hit, I thought he would be OK, maybe because of my own experiences. Hearing that he had passed away was quite a shock. "It's a reminder for me to count my lucky stars, to be grateful for each day of life that I have to enjoy." Could head injuries be eliminated? Read more on Phil Hughes: Could head injuries be eliminated?